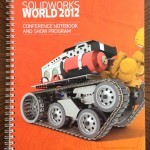 SolidWorks World 2012 Starts Today! I’ve arrived in San Diego. First order of business this morning was to register for the conference and grab some breakfast. 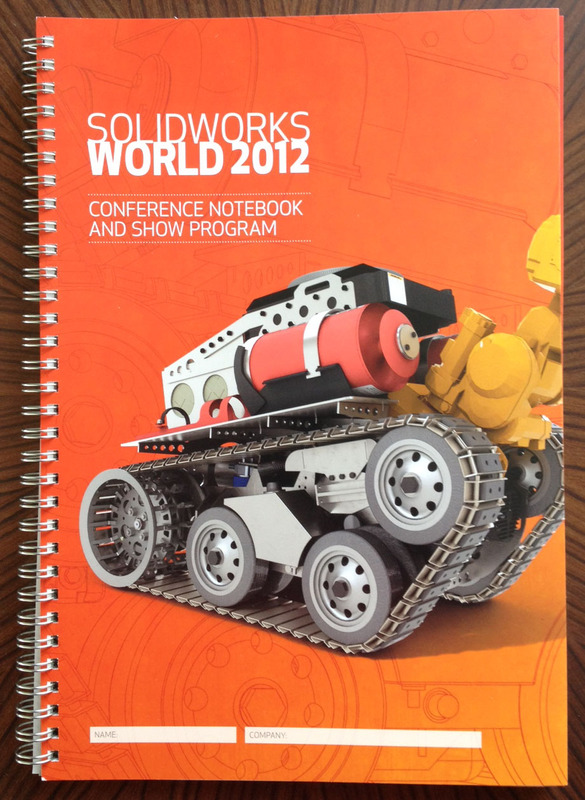 Registration was exciting for me this morning because I noticed SolidWorks is using an image I created on the conference notebooks, t-shirts and phone apps. I always like to see my work pop up. Met up with a bunch of people for breakfast and if you are following the Twitter hastag #sww12 you probably have seen me in more than one photo and know what’s happening all over the area around the convention center. Twitter is a great way to follow what people are doing and where to meet. SolidWorks World 2012 starts today with a welcome reception at 5:30. I’ve been fine tuning one of my presentations and relaxing a bit before things get started. Once the conference kicks off it will be a non stop whirlwind ride until Wednesday afternoon so I thought I’d get my rest in now 😉 You can find me at the Boxx booth (booth #506) during the reception. If you’d like to to talk rendering, animation, computers or just say hi stop in. After the reception you can find me at the Tweet Up. If you have a Twitter account you’ll want to stop by. You can find the Tweet Up at the Bayfront Hilton, room Aqua 310 and it starts at 8:00. Just wanted to give you the quick run down on what’s happening Sunday. Things will REALLY get rolling Monday. I've been a member of the SolidWorks user community for many years. This blog is an extension of that community involvement and allows me to share what I hope is useful information with a wider audience of users. In compliance with the new FTC blogger guidelines and in an effort to have full transparency with my readers I need to post some full disclosure statements. I am a member of the DS SolidWorks user group program as a group leader. I am not compensated for my user group involvement. DS SolidWorks Corporation has paid for my travel, accommodations, and some meals for various user group events including SolidWorks World. I am in occasional contact with employees at DS SolidWorks Corporation and am sometimes asked to provide feedback on new products or programs. I am not compensated for these efforts. I provide occasional consulting services to DS SolidWorks Corporation, for which I receive compensation. DS SolidWorks Corporation provides me with a license of SolidWorks Office Premium.